Not to be confused with Taza Khurmatu. Tuz Khurmatu (Arabic: طوزخورماتو‎, Turkish: Tuzhurmatu also spelled as Tuz Khurma and Tuz Khormato or just Khurmatu) is the central city of Tooz District in Saladin Governorate, Iraq, located 55 miles south of Kirkuk. The town is multi-ethnic, with a majority of Turkmen and Kurdish and Arab minority. In the 1947 census, 40% of the population was Kurdish. A U.S. Army Soldier and a Turkish Air Force member transport an Iraqi child to safety during a multinational humanitarian airlift effort on Kirkuk Air Base, Iraq, July 8, 2007. The victim was hurt in an attack in Tuz Khurmatu. The town participated in the 1991 Iraqi uprising before being suppressed by the Ba'athist Iraqi army. Since the 2003 invasion of Iraq, the city has experienced significant violence. It has been frequently bombed by Al-Qaeda in Iraq and its successor the Islamic State of Iraq and the Levant, as well as the PKK. On June 2, 2005, at least 12 people were killed and at least 40 wounded in an explosion targeting a restaurant. On June 23, 2005, a car bomb detonated by remote control hit an Iraqi police patrol, killing one policeman and wounding 7 civilians. On September 20, 2005, insurgents detonated a car bomb targeting Shiite worshippers as they were exiting the Hussainiyat al-Rasoul al-Azam mosque, killing at least 10 and wounding 21 others. On March 14, 2007, a suicide bomber struck a market and killing 8 and wounding 25. 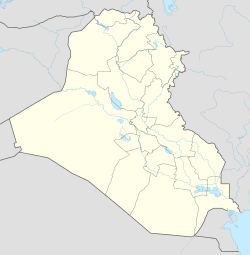 On September 7, 2010, the first US casualties after President Barack Obama declared an end to US combat operations took place near the city when an Iraqi soldier killed 2 US military personnel. On October 27, 2012, a car bombing next to a building owned by a Shi'ite endowment killed two civilians and injured ten others. On December 17, 2012, two consecutive car bombings hit a residential area near the city's General Hospital, killing 11 civilians and injuring 45 others. The attacks were part of a country-wide wave of violence that killed almost 100 people in a single day. On January 16, 2013, a suicide car bombing at the offices of the Kurdistan Democratic Party killed 5 and injured 40 others. On January 23, 2013, a suicide bomber blew himself up during a funeral for a politician's relative in the city, killing 42 and leaving 75 others wounded. In November 2015, the town experienced clashes between the Kurdish Peshmerga and Shia Popular Mobilization Forces that claimed 11 lives, wounded over 20 people, and damaged over 200 houses through arson committed by both sides. A truce was reached soon after. On November 28, 2015, a suicide bomber bombed a town checkpoint, killing 6. Ali Kanbar Ozdamer (1919–1999) was a well-known artist from the area. ^ "Iraq (1947)". Kurdstat.com. Retrieved 5 April 2019. ^ Goldstein, Eric (June 1992). Endless Torment: The 1991 Uprising in Iraq and Its Aftermath. U.S.: Human Rights Watch. p. 58. ISBN 1-56432-069-3. ^ "20 dead in Iraq bombings". The Guardian. Retrieved 15 May 2016. ^ Reuters (2013-01-15). "Bombers kill more than 35 across Iraq". Trust.org. Archived from the original on 2013-02-21. Retrieved 2013-01-15. ^ Marwan Ibrahim (2013-01-23). "Iraq suicide bomb at Shiite mosque kills 42". Google News. Retrieved 2013-01-24. ^ Margaret Griffis (2013-01-23). "At least 51 Killed, 98 Wounded in Iraq Attacks". Antiwar.com. Retrieved 2013-01-24. ^ "Eleven dead as tensions flare in Tuz Khurmatu". Kurdistan24. 2015-11-15. Retrieved 2016-01-11. ^ "Absent government, fragile truce holds in Tuz Khurmatu". Iraq Oil Report. Retrieved 15 May 2016. ^ Joel Wing. "MUSINGS ON IRAQ". Retrieved 15 May 2016. ^ "Suicide bomber kills 6 in flashpoint town". Yahoo! News. 2015-11-28. Retrieved 2016-01-11. ^ "Sketch Gallery of Iraqi Artist Ali Kanbar Ozdamer". Flickr – Photo Sharing!. Retrieved 15 May 2016.